Thankfully, my mom has nothing to worry about. I’ve picked up all her clean-freak tendencies. There are few things I like better than putting the last clean t-shirt into a drawer and knowing all the laundry is washed, dried, and put away. Or seeing my pantry organized, with all the cans displayed by kind, with labels facing out. Our walking out of my kids’ rooms knowing the Legos are with the Legos, and the dolls are with the dolls, and the missing Green Lantern action figure has been reunited with his plastic motorcycle. Ahh. . . Unfortunately these aren’t joys I can indulge in often because I have kids! I’m giving away 3 copies of Darlene Schacht’s book, Messy Beautiful Love, to 3 lucky winners! Enter to win below. Winners will be announced next Monday September 22nd. Only those in the U.S. are eligible to win. I have 3 girls, one that just got married, and the youngest is 8 y/o. I would love all the messes in the house if it meant getting more time to give them love and enjoy the moments with them. The house might be a little cleaner now, but it’s also more quiet. I miss the days of the loud messy house. post I read. 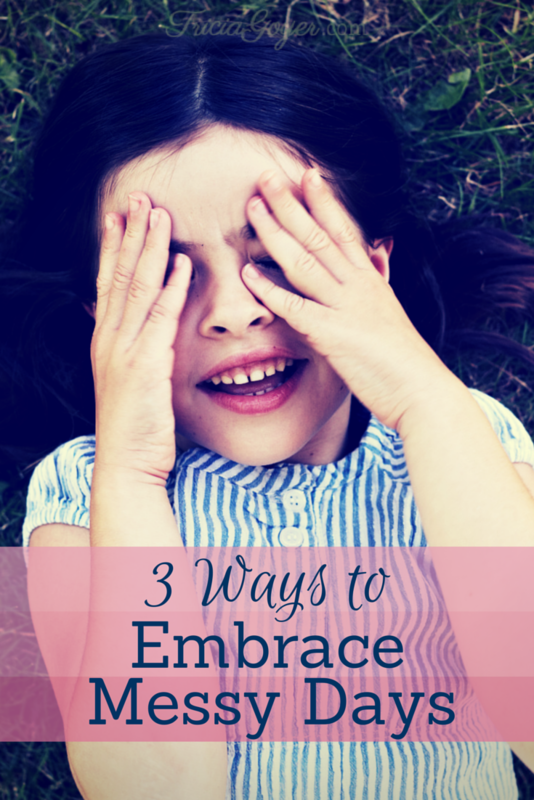 And after this post 3 Ways to Embrace Messy Days.